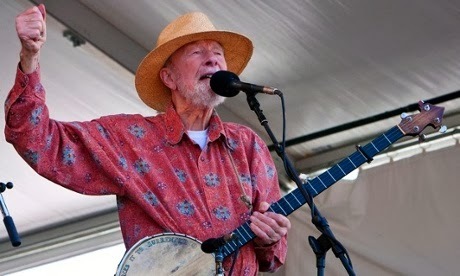 "Pete" Seeger, an American folk singer and activist died last week on 27th January 2014. He was 94. Pete was a regular fixture on nationwide radio in the 1940s, he also had a string of hit records during the early 1950s as a member of the group Weavers. His career took him from labour rallies to the Top 10 in college auditoriums and to folk festivals. This week, we have the same song featured here as a tribute to Seeger. Readers from India might be well be surprised that a very popular song in India, “Ham honge Kamyab ek din” is based on this song by Pete Seeger.